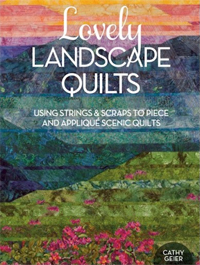 Welcome to Patchworks that Praise - the one stop quilt fabric shop for landscape quilting fabrics and the home of Cathy Geier's art quilt gallery of landscape quilts. There are over 100 bolts of landscape fabrics here and a huge selection of fat quarters. Be sure to check out Cathy's blog to see more of her quilts in progress and learn more landscape quilting techniques! Cathy would love to share her quilts and their stories with your quilt guild, follow the link to her Workshop page to see what classes she offers and learn about her trunk show. Find Cathy on Facebook and Pinterest.